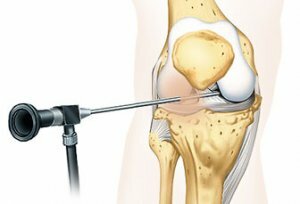 When is a knee arthroscopy applied? In cases of meniscus injuries, cruciate ligament injuries and partial articular cartilage injuries. Knee arthroscopy is a gentle keyhole surgical technique that uses smallest skin incisions to insert high definition surgical cameras and precision tools into the knee’s articular cavity. In case of a meniscus injury, the meniscus will be either partially removed or – if possible – sewn. In the event of an anterior cruciate ligament loss, it will be restored by using autologous tissue. Partial articular cartilage injuries can be improved by means of various techniques such as cartilage cultivation, for example.